Whether you use a modest charcoal grill or an upscale Weber, we’ve got your BBQ success covered! Here’s 13 genius grilling hacks that will take your ‘cue to the next level. Keep all of your barbecue trimmings in one convenient place: a muffin tray! The 12 sections are perfectly suited for housing your condiments. The next time you use your grill, clean it while it’s still hot. Slice an onion in half, and use it to scrub the drippings and other gunk off your grill. It should come off easily. Place an old barbecue grate across your existing one before grilling vegetables. The grid should keep your veggies from slipping through, while giving you the flame-licked taste you savor. If you like chunkier vegetables, wrap spiced sweet potato, potato or zucchini squares in foil and throw it on the grill. After 10 minutes, you’ll have a delicious, healthful side dish! Double your skewers per kebab so individual pieces of meat or chicken don’t rotate on their own as you flip the kebab. Wrap some wood chips in foil, poke holes in the parcel and toss it on top of the grill’s burner below your grate. Keep your grill on medium-low. Your parcel will lend your food a hint of sensational smokiness! To check the propane level in your tank before you start, tilt it a bit and pour boiling water on its side – but not its top. Now feel your tank. Wherever there is propane inside, it will feel cool to the touch. For an easy burst of flavor for your grate, halve some lemons and grill them on low heat for a few minutes, peel-side down. Skewer a hot dog and rotate it slowly as you cut it along its length for a spiraled look. It will cook more evenly, give you places for holding condiments, and look super cool! 10. Short on time? Nuke it! Cook your chicken in the microwave until it’s nearly ready. Then, throw it on the grill to give it a flaming finish! To help your cooked meat retain moisture and to distribute its juices evenly, let it rest under a loose foil tent for ten minutes before serving. Throw a wheel of cheese directly on the grill and let it melt a bit. Scoop it off the flames before it completely liquefies and then serve up the most delicious, gooey spread! 13. Use all the heat! 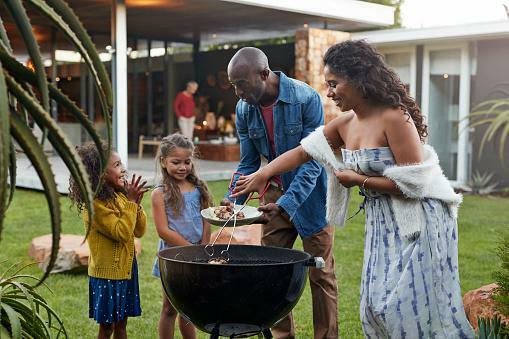 When you’ve finished cooking, pile your still-warm grill with any foods that need to stay warm, your buns, or some foil-wrapped s’mores for a delectable dessert!